Bearded dragons are lizards in the family Agamidae from Australia. Seven species of these reptiles exist, and a few are frequently seen in homes as pets. Central or inland bearded dragons (Pogona vitticeps) and eastern bearded dragons (Pogona barbata) are both particularly beloved in the pet world. Bearded dragons are generally yellow or beige. Although these lizards don't possess legitimate "beards," they expand the skin of their throats when they feel possessive or frightened, creating the appearance of a beard. Bearded dragons are often inquisitive, mild and easygoing. They live terrestrial lifestyles. These coldblooded creatures adore the sun and commonly bask under its warm rays. Fully mature male bearded dragons can achieve lengths of 2 feet. The average life expectancy for these reptiles is roughly 10 years in captivity. In the wild, their life spans are usually shorter. In the wild, many factors can shorten their life spans, including scarce food supplies and predators such as snakes. In captivity, bearded dragons frequently succumb to diseases such as respiratory problems or metabolic bone disorders. If you have a pet bearded dragon, regular checkups with a veterinarian who specializes in reptiles are an absolute must to maximize his life span. Veterinary care such as blood tests and screening for parasites can help ensure that your bearded dragon stays fit as a fiddle for as long as possible. Take your pet to the veterinarian at least once a year. You can promote your bearded dragon's health with a proper diet. These omnivores thrive on a combination of veggies and meat. Youngsters feed mostly on tiny bugs. As they get older they tend to consume a lot more of the green stuff. 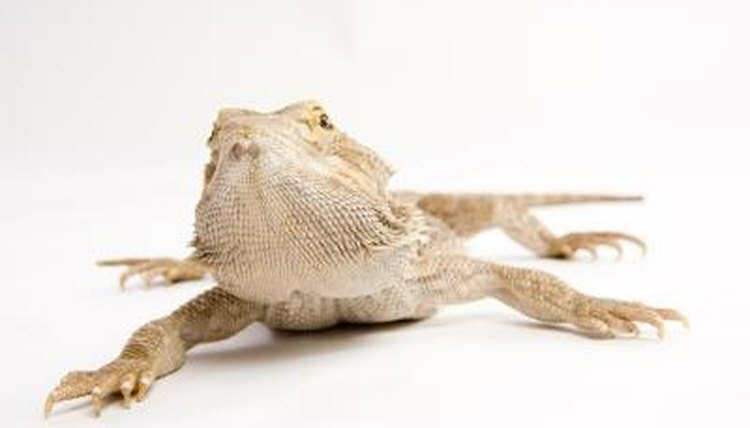 Some common fleshy food options for bearded dragons are mealworms, crickets, pinky mice, beetles, moths, cockroaches and earthworms. Suitable vegetables include mustard greens, dandelions, peas, carrots, kale, endive and squash. Fruits such as bananas, apples, grapes, apples, melons, figs and peaches are acceptable in strict moderation. Never offer your bearded dragon any food unless you're absolutely certain it's safe and nutritious. Youngsters typically need to eat two or three times daily, while fully mature specimens generally eat once every two or three days. If you have any dietary questions, ask the veterinarian first.